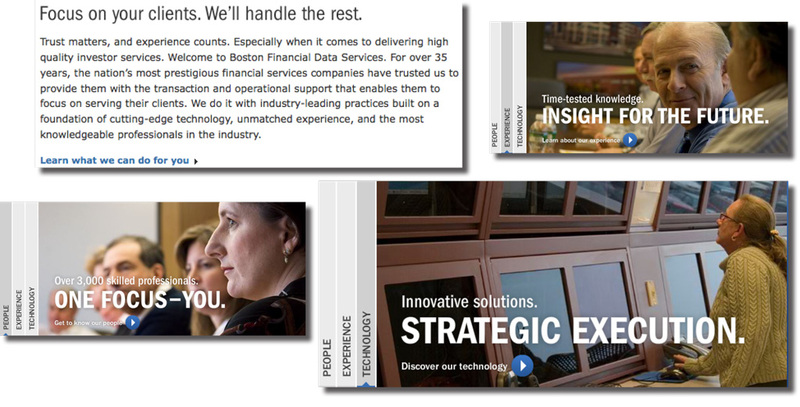 Boston Financial is one of the world’s largest mutual fund transaction processing companies. This project represents a complete “soup-to-nuts” engagement for me in content strategy and copywriting for the web. My role, working with PixelMEDIA of Portsmouth, NH, involved establishing the verbal pillars of the brand, developing a messaging strategy for the website to speak to a segmented audience, working with interactive designers, and I wrote all the copy on the site. Five-year engagement with Timberland, writing for countless boot launch campaigns. This piece was used for POS and transit advertising in NYC and Washington D.C.
• Successfully established Boston Financial’s brand positioning and spoke more relevantly to the needs of BF’s segmented market. • Website remains mostly unchanged after three years online.